Long gone are the days when Norges Bank, the central bank of Norway, ran a tight monetary policy. 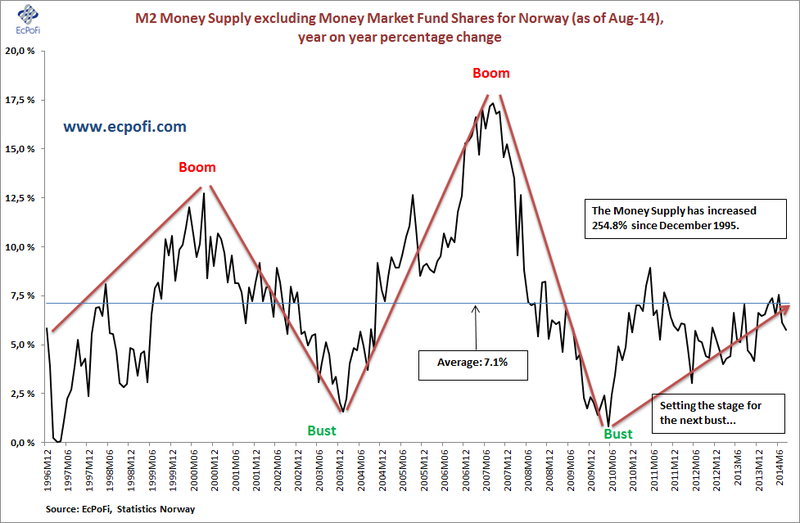 Just since December 1995 (no data available earlier), the money supply in Norway has increased 254.8%. 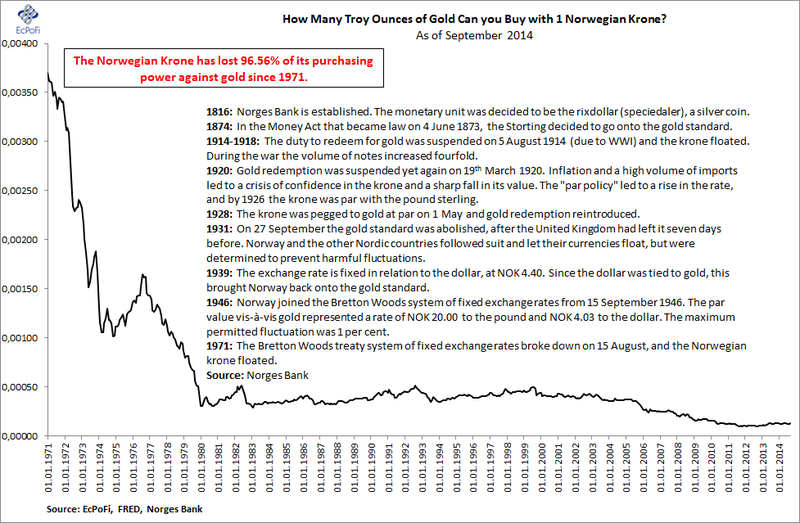 Back in 1971, when the Norwegian Krone was partly tied to gold as part of the Bretton Woods system, one Norwegian Krone would buy you 0.003697 troy ounces of gold. Today, you would only get 0.000127 troy ounces for the same amount. Since the Bretton Woods system was ended in 1971, the Norwegian Krone has lost 96.56% of its value compared to gold. The reason the Norwegian Krone has lost almost all its value compared to gold is not because there is less gold around today than it was in 1971. Rather, it's all caused by an increase in the money supply of Norwegian Kroner that greatly surpasses the amount of gold mined (click here for more on gold and gold production). Norges Bank could have chosen to be prudent and run a tight monetary policy. It chose not to in line with all other central banks around the world. As a consequence of central banking backed by tax payers and fractional reserve banking, most western countries and Japan today suffer economically with bloated public sectors and high debt while the average Norwegian has been turned into a debt slave.